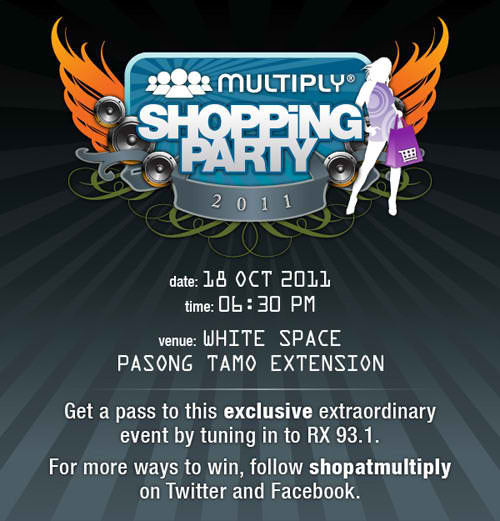 Free Invites to the MULTIPLY Shopping Party! The year 2011 saw the evolution of Multiply from a social networking site to the Philippines’ biggest online shopping destination with over 100,000 on-line shops across 16 categories such as fashion, gadgets and mom and baby products, to name a few. Aside from opening its virtual doors to digital shoppers, Multiply has also become a choice platform for technoprenuers looking at starting their businesses. With the enormous amount of support it has been receiving in the country, Multiply also opened its first office in the Philippines earlier this year as a testament of its commitment to the market. To celebrate its amazing year thus far, Multiply will be throwing a party the best way it knows how: a first-of-its-kind shopping party that will bring to life the unique online shopping experience that only Multiply can offer. This by-invitation-only event will bring to life some of Multiply’s top online shops. The Multiply shopping party will also showcase the newly revamped Multiply interface that conveniently features the latest shopping finds, best sellers and featured sellers. New enhancements were made specifically to make online shopping at Multiply easier, more secure, and more fun. Guests will also be treated to a fashion show that will showcase pieces from Multiply shops. Live performances will also amp the festivities with music from Pinoy rock band Techy Romantics and a performance by DJ Mars Miranda. To make it even more exciting, guests will be given special cards to share items and shops that catch their fancy during the event to their Facebook friends. They’ll be able to “Like” the items at the party just by swiping these cards at the terminals where the items are showcased. Multiply is the first in the Philippines to use a technology to enable people to share real-world experiences with friends via Facebook. To win exclusive invites for Multiply’s shopping party on October 18, tune in to radio partner RX 93.1 where tickets will be given away daily. People can also like Facebook.com/shopatmultiply or followtwitter.com/shopatmultiply on Twitter for more information on the event and for ticket giveaways. The event is co-presented by Sun Cellular who will be giving away great raffle prizes and tokens for the guests and BDO who will be the on-ground payment facility for the event. Special thanks goes to David’s Salon who will be giving free styling tips for the night. NOW WIN FREE INVITES RIGHT HERE, RIGHT NOW! 1. Must be a follower of my blog and also an active blogger. 3. Repost on your facebook, twitter account or blog. Tag @paxieness & hashtag #multiplyshoppingparty (on twitter) & @drowningequilibriums on facebook or leave link of blog post below. 4. Answer this: What's the best item you've shopped on multiply and from what store? 5. Leave your name, email & blog url below. That's it! Will choose 10 winners on October 16, Sunday. See you there! The best item that I bought on multiply is lactation cookies and muffin by mommy treats. You need to order first before she makes it and assured that it's newly baked. I love her service to her customer and I am more willing to purchase more. 5. The best item I shopped on multipy are 4 pairs of gorgeous shoes from Chick Flick Collection. I got this really pretty white blazer from thriftmanila.multiply.com \m/ Best bargain find !! The best item I had bought.. there's a lot! But I love the Receipt Organizer from Store and Stack! Keeps my bills organize! Can even use when traveling to separate different currencies/bills! Yey! 2. Added Shop Multiply in Twitter and FB. and my polka dot shorts& blazer from Hubs and Buns. "What's the best item you've shopped on multiply and from what store?" The best item I've shopped on Multiply are thrifted clothes which are very adorable from the one and only UkayQueen!